PAWTUCKET, RI—In a move designed to capitalize on the company’s successful five-decade legacy of quality foam weaponry, representatives from Hasbro armaments subsidiary Nerf announced Thursday that they would be diversifying their line of dart, disc, and ball launchers to include actual firearms. “We cannot emphasize enough that these are not toys,” said CEO Mark Ridley, noting that newly released products such as the .44 Nerf Magnum Revolver and NR-15 Tactical Assault Rifle are intended for home protection and hunting and are poorly suited for chasing nephews around the yard at family barbeques. “They may carry the legendary Nerf brand on the precision-forged aluminum receiver, but they are chambered for the 7.62mm rifle cartridge, which will penetrate a kevlar vest at 200 meters. Yes, you can still find them in the children’s section—after all, these firearms have the same ease of use and potential for hours of fun customers have come to expect from our brand—but they rely on lead for stopping power, not merely the power of imagination. 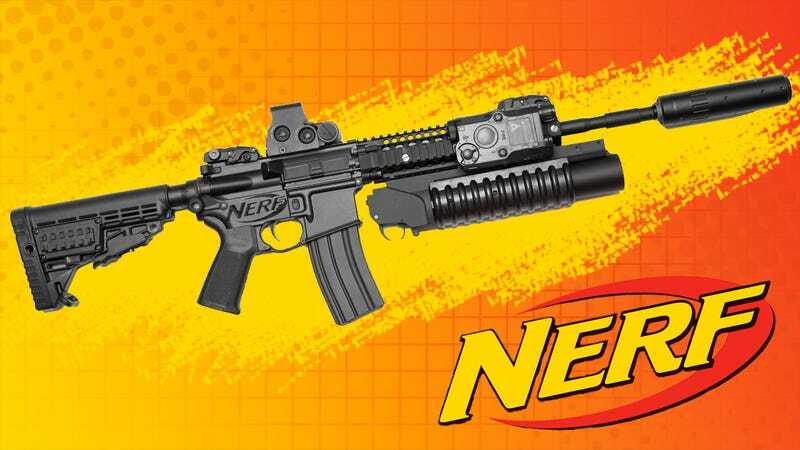 Remember, when your family’s safety is threatened, it’s Nerf or nothin’!™” Nerf also signed a contract to supply $375 million worth of law enforcement, glow-in-the-dark suction-cup, and military armaments to the government of Saudi Arabia.